Smoke billows from buildings after reported airstrikes by the Saudi-led coalition on arms warehouses at Al-Dailami air base, north of the capital Sana'a, Sept. 29, 2015. Civilian casualties in Yemen continue to spiral, largely due to relentless Saudi-led airstrikes against Houthi rebels, the U.N. Human Rights office reported Tuesday. An airstrike Monday hit a wedding party, killing 131 people and making it the deadliest single incident since the start of the country's civil war, U.N. officials and local medics said Tuesday. The Saudi-led coalition, which has been targeting rebels since March, denied it was responsible for the attack on the village of Wahijah. Spokesman Brigadier-General Ahmed al-Asseri called the allegation "totally false." Civilians have been caught in the yearlong battle between Houthi fighters, who seized the capital Sana'a last September and then pushed south to the port city of Aden in an offensive that sent President Abd-Rabbu Mansour Hadi fleeing to Saudi Arabia. 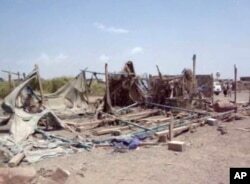 This still image taken from video shot Sept. 28, 2015, shows destruction to buildings after an airstrike hit a wedding party in al-Wahga, a village near the strategic Strait of Bab al-Mandab, Yemen. The civilian death toll in Yemen over the past six months includes 2,355 killed and 4,862 wounded, including many women and children, the U.N. Human Rights office said Tuesday. The figures don't include Monday's casualties. However, the U.N. said it believes the overall toll is underestimated and the number of civilian casualties is higher. Human Rights spokesman Rupert Colville blamed both sides in the conflict, saying civilian casualties continue to be a result of airstrikes and indiscriminate shelling in residential areas. Colville said an increasing number of deaths and injuries have been caused by airstrikes targeting bridges and highways. The Human Rights office also blames the Saudi-led coalition’s naval blockade of Yemen’s main seaports for hampering the import of vital humanitarian supplies. A sectarian civil war between minority Shiites of the northeast and majority Sunnis in southeast--with outside intervention. Houthis – Members of the Zaidi sect of Shia Islam who historically held power in Yemen, now complain to be politically marginalized. Seized control of capital, Sanaa, September 2014. Yemen President Abdrabbuh Mansour Hadi – Took office in 2012. Fled to Aden, then Saudi Arabia in early 2015. Internationally-recognized as Yemen’s legitimate leader. AQAP – Al Qaida in the Arabian Peninsula, a Sunni jihadist group that could use political chaos in Yemen to exert influence over Yemen’s Sunnis. IS – Claims responsibility for several attacks against Houthi mosques since July 2015. Iran – Iran, Saudi Arabia’s chief rival for political influence in the region, backs the Houthis. Saudi Arabia – Views Houthis as Iran’s proxy and fears they could ignite Shiite uprising inside the Kingdom. In March 2015, Saudi Arabia and nine regional allies began air strikes against Houthis. United States – Supports President Hadi’s government in exile. Provides support to the Saudi-led coalition to defend Saudi Arabia’s border, contain Iran’s influence, and prevent growth of AQIP and ISIS in Yemen. U.N. aid agencies said this is greatly exacerbating the extremely dire humanitarian situation. It reported that 4 of 5 Yemenis -- about 21 million people -- are in need of humanitarian assistance. In addition, the WFP said the conflict is causing the country's child malnutrition rate, which is normally high, to soar to life-threatening levels. Meanwhile, a high-level meeting on Yemen during a U.N. global gathering Tuesday repeats an urgent call for humanitarian aid access but makes no mention of the latest civilian deaths or who might be to blame. Tuesday's statement calls the humanitarian situation in the Arab world's poorest country "appalling." The meeting, chaired by Britain, the U.N. humanitarian chief and the Organization of Islamic Cooperation, noted that "civilian suffering has reached unprecedented levels," with thousands killed. While it calls on "all parties to the conflict" to bear their responsibilities, it does not go as far as U.N. Secretary-General Ban Ki-moon, who on Monday said "most of the casualties are being caused by airstrikes." A statement late Monday from Ban's spokesman highlighted the illegality of attacks against civilians and said Ban again called for all parties in Yemen to halt the fighting. The fighting has forced about 1.8 million people from their homes in Yemen, according to U.N. data, and left many more in need of food and other basic humanitarian aid. Lisa Schlein contributed to this report from Geneva. Some material for this report came from AP.